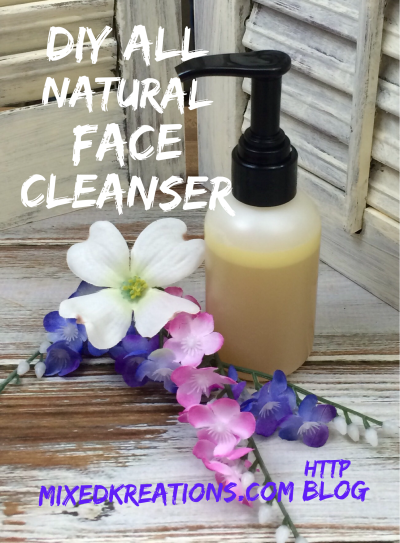 I found this recipe for a Diy all natural face cleanser at Body Unburdened. It was suppose to be a clarifying & toning foaming facewash, but when cleaning out my foam pump bottle the bottom looked a little dirty so I was trying to clean it out using a spoon handle and poked a hole through it. Guess I had that bottle to long, time to find another. So I modified this Diy All Natural Face Cleanser recipe and just put in a regular pump bottle. Mix well and add to a pump bottle, shake before each use. Do you have any easy diy all natural face cleanser recipes? And I’ll bet it smells great too! Thanks for sharing! If you try it I suggest using the unscented castile soap that way you can make it your own scent. I bought the lavender scent so its hard to add my own scent the lavender over powers it. It is quite simple, I love it and will be making more. I love this recipe. I’m all for DIY body products. I haven’t heard of Castile soap before. Where can you buy it? You can find it at health food stores, HEB, and I think I’ve seen it at Walmart. This sounds like I would put it on my face and never take it off! Going to have to mix up a batch and try!